When I first saw Outlander and the rest of Diana Gabaldon's romance time-travel series at the bookstore, I had no intention of ever reading its synopsis. The premise seemed as if it would be boring, based on the appearance of its book cover. I finally caved in and purchased a copy of Outlander after a friend of mine recommended the series, insisting it was one of the best series she had ever read. I usually take book recommendations with a grain of salt, but since I considered that particular friend one of the smartest people I knew at the time, I listened to her, and I'm glad I did, because I was glued to this novel from start to finish. Outlander opens in Scotland during the year 1945. Claire Randall is an English-born nurse visiting Scotland with her husband, an historian. After wandering around the Scottish Highlands, she touches a rock and is unexpectedly thrust back into the year 1743. Luckily, Claire knows a bit about life in 1743 Scotland given her husband is a historian. But when she learns that it isn't as easy to time-travel back to the present, she is faced with adjusting to her new life in this time period. Upon arriving in 1743 Scotland, Claire immediately meets her husband's ancestor, the evil and terrifying Jonathan Randall, but actually begins a love affair with Jonathan's enemy -- a sweet and brave clansman named Jamie Fraser. After spending months in Scotland (making hot, passionate, sweaty love with Jamie), Claire is not so sure she still wants to find a way back to 1945 to her studious husband Frank. Outlander reads like an epic historical fiction novel, but could also be classified as romance. At several hundred pages, this book definitely has its slow moments, but is worth your time, if only for the time-traveling element. If you really enjoy time-traveling novels, give Outlander a try. Other good time-traveling novels I've read are Household Gods by Judith Tarr and Harry Turtledove, and Forever in Time by Barbara Bretton. The next books that follow Outlander in the series are Dragonfly in Amber and Voyager. 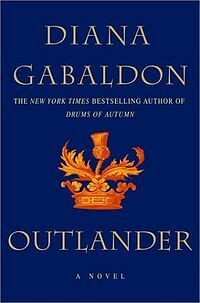 Have you read Outlander, and if so, what did you think? Which time-traveling novels stick out in your mind? Share your thoughts and comments with us below! I think Outlander is a love it or hate it kind of book. I have a friend who loved the entire series and said she couldn't put them down. I just couldn't buy into it and didn't find Claire's decisions or inner dilemma believable. But I'm also not a huge fan of historical fiction, so maybe it just wasn't my kind of book! Well, I DID love this first book, but didn't care for the second book, Dragonfly in Amber. It was too long and drawn out, so I didn't finish it!